1. Moisten a clean sponge and wipe bisque to remove any dust. 2. Use the Soft Fan to apply two thinned coats of SC-93 Honeydew List to the scarf and mittens. 3. Apply one thinned coat of SC-27 Sour Apple over the Honeydew List, letting it puddle in the detail. 4. Use a Soft Fan brush apply three thinned coats of SC-73 Candy Apple Red to the jacket and hat band. When dry, use the Script Liner to float SC-81 Cinnamon Stix into the shadow areas of the jacket. 5. Use a Liner brush to float SC-30 Blue Dawn around the snowman's body and facial features. 6. Use the Liner to add stripes to the scarf with two coats of SC-73 Candy Apple Red. Outline the stripes with SC-15 Tuxedo. Add black dot detail with the tip of the Liner pressed at the tip of the brush. Use the Liner to float SC-8 Just Froggy in the creases and edges of the scarf and mittens. 7. Using a snowflake paper punch available from craft stores, punch out the snowflake shapes - you'll use the negative space from the punch. Wet the areas on the jacket for the paper shape and press onto the snowman. Make sure to seal the edges to prevent colour seeping. Apply two coats of SC-16 Cotton Tail then remove the paper. 8. Apply SC-16 Cotton Tail to the areas on the body with the blue snowflakes. Press the paper shapes into the wet glaze, then apply two coats of SC-30 Blue Dawn. Remove the paper. 9. Sponge the cheeks with SC-2 Melon Choly. Apply two coats of SC-75 Orange A Peel to the nose and two coats of SC-30 Blue Dawn to the eyes. Use the Liner to outline mouth and eyes and around the scarf with SC-15 Tuxedo. 10. Aapply two coats of SC-15 Tuxedo to the hat and one coat to the buttons. 11. Apply one coat of SG-701 Star Dust to the jacket and Hat. 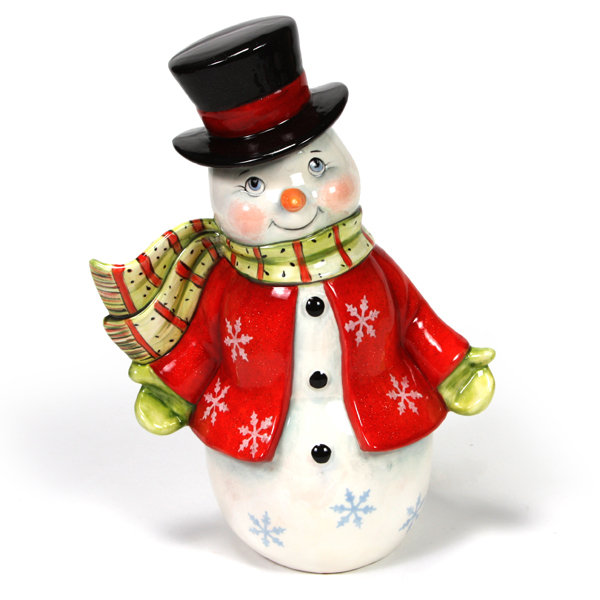 Use the same brush to apply S-2101 Clear Brushing Glaze to the remainder of the snowman.